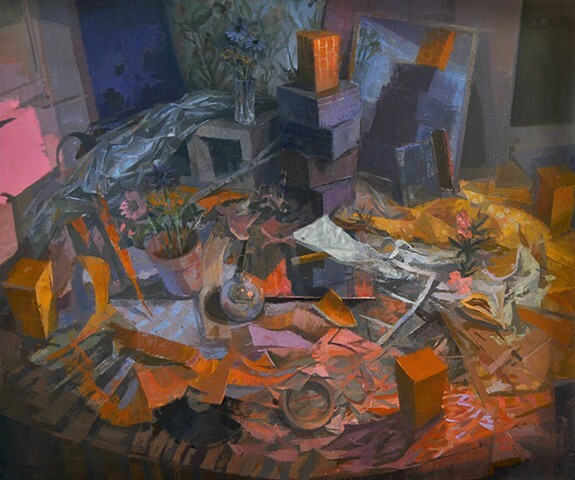 My current work explores the subject of still life painting as a convergence of memory, imagination, and perception. I paint toys and common household items that together evoke the domesticity of childhood. The objects are painted both from memory and observation. They accumulate as I paint, resulting in an anxious clutter of discarded items-- some described in detail, others left as half-formed thoughts or faded memories. The space is dreamlike and suffused with an ethereal light that lends the objects a poetic resonance. I want the paintings to unfold before the viewer as the initial clutter and chaos give way to an emergent, rhythmic order. As the viewer explores the space, the act of looking becomes one of discovery and delight. Childhood anxieties and the losses that accompany the passage of time are interwoven with a renewed joy and liveliness. The objects, suspended between these contrasting experiences, become players in a drama that speaks to the mystery and complexity of living.